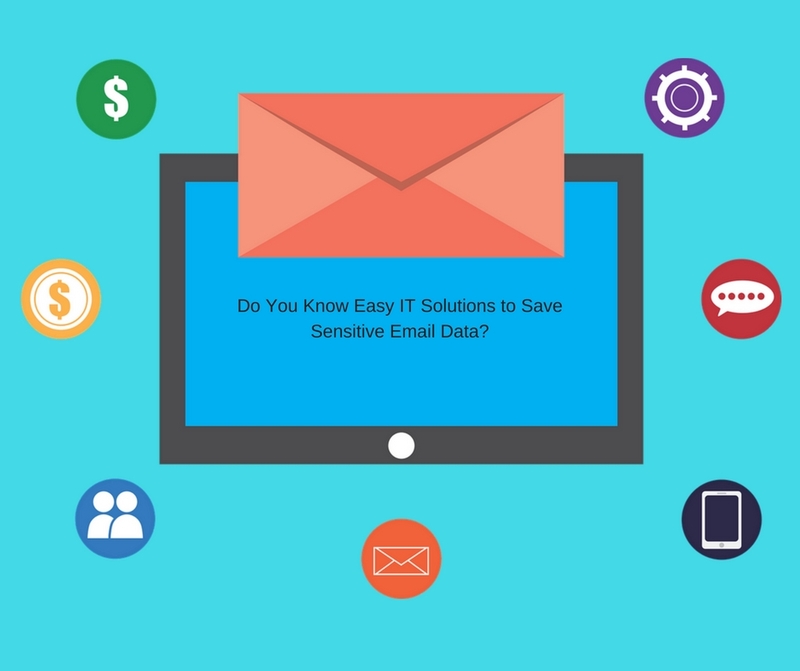 Do You Know Easy IT Solutions to Save Sensitive Email Data? Would you ever like to recall lethal ransomware attacks of WannaCry and Petya? They unleashed their deadliest aftereffects upon 100+ countries’ system users. The keyboard gave up its motion. The screen stayed frozen. Millions of data was encrypted. What’s emerging on the screen was the message to pay ransom. Cybercrime police got decipher traces of hackers. Cyber-bully is, now, at its peak. What did hackers want as ransom? However, this cryptocurrency was coined for anonymous transaction between two parties. The third party verification was not needed. This currency was evolved for the good reasons. But hackers derived filthy practices of molesting innocents. During all these cyber-attacks, the stealing of contacts from the inbox was the worst. Your own emails became hacker’s whistleblower. Many organisations lost millions of data. Emails are vulnerable. Encrypt them. It’s really scary when some anonymous one peeps into your sensitive details. It can be your back account username; your password; your account number or health details. Would you ever like to see your sensitive data going public? I’m sure none would ever push the ‘like’ button to this question. With the boom of automation, the messaging is digitized. Won’t you believe? These stats clearly indicate that messaging is shifted to the digital landscape. It’s widespread. And it’s irresistible as well. Now answer-won’t you obey what the hacker would say to do? Of course, you’ll follow just like a helpless puppet. It’s so because you want to save your sensitive data from going public. It’s really hard to think of all this happening. Many organizations bet on multiple IT services to simplify and secure their back office work. But just a patch reverses their efforts. So! How would you take preventive measures? I’m asking for preventive measure because decryption lies in the hands of hackers. Until and unless you pay the bitcoins, your email data would be encrypted. Such evil practice can be stopped. You can halt it. How to save email data from hackers? As told above, end-to-end encryption can stop all these filthy malware/ransomware attacks. This method converts the data into incomprehensive form. Not even you can understand it unless you decrypt it with the key. The key would be a unique code that can unlock the encrypted data. So, what you can do is to go for this encryption. Then, only you and the recipient would be able to unlock it using the key. Example: Whatsapp; it applies encryption key to the unseen data. And the key to decrypt it would be vulnerable to the authentic users only. Isn’t it a great idea to hide your personal details! There are many software on the internet that assure this IT solution of end-to-end-encryption. I’ve done it. And the result was amazing. I got a number of this service provider. Why end-to-end encryption for email data? It runs two-factor authentication. Whether it’s sending or receiving, this method of authentication asks for the key to unlock the message. Then only, it comes to readable form. It’s like unlocking your own mobile phone by inputting the set pattern. And then, decode the way to photo-gallery. What user has to do is to provide password for login. Then, use the private key. Subsequent to sending, the recipient would require proof to prove its authentic recipient. He would receive the code via email or SMS on mobile phone. Then, the authentication will meet its end process. There is another way called PGP. It stands for pretty good privacy. The sender can deliver the email by using public key. On the contrary, the recipient would have to provide private key to decrypt. Once it is entered, the whole email will be open. For example, Mailvelop that is compatible with the Google and Firefox. However, upgrading versions of Windows can keep hacking at bay. But still, prevention is better than cure. Bear this fact in mind!